Μια τρύπα στο νερό. Έτσι απλά και κυνικά χαρακτηρίζουν οι New York Times την συμφωνία που υπεγράφει μεταξύ της Ε.Ε. και της Τουρκίας για την επαναπροώθηση των μεταναστών και προσφύγων και την διαδικασία παροχής ασύλου. Όπως εύστοχα επισημαίνεται στο μακροσκελές ρεπορτάζ, το θέμα του διαχωρισμού μεταξύ των μεταναστών και προσφύγων ξεσπά βίαιες συγκρούσεις ανάμεσά τους, καθώς οι Αφγανοί νιώθουν ότι η επιστροφή τους στην Τουρκία πλησιάζει, χαρακτηρίζοντας άδικη την μεταχείριση τους σε σχέση με την αντίστοιχη των Σύρων. Παράλληλα, το δημοσίευμα χαρακτηρίζει "στρατιωτικού τύπου κλειστά κέντρα" υποδομές όπως τη ΒΙ.ΑΛ. που προκαλούν ακόμη μεγαλύτερη ανησυχία στις τάξεις των προσφύγων. CHIOS, Greece — Hani Alkhalaf had just fallen asleep at an overcrowded detention camp for migrants on this Greek island when angry shouts jolted him awake. As he rose from the dingy floor, a barrage of stones rained down on the flimsy plastic container where he and 14 other asylum seekers, mostly Syrians like him, were sheltered. Panicked, the women and children ran into a corner and tried to shield themselves as a mob of Afghan migrants beat on the barricaded door, he recalled later. Tensions had been simmering for days between Afghans and Syrians in the camp, but by midnight last Friday, they had exploded into a riot. Under a deal that took effect last month, all migrants who arrived in Greece after March 20 are to be deported to Turkey. Nearly 1,000 Afghans and Syrians tangled during the brawl, which stretched on for six hours before the police intervened. It ended after around 800 migrants broke out of the detention center and marched in protest to the main port of this vacation destination, where many took shelter under slatternly tarps and pup tents on a vast concrete expanse. 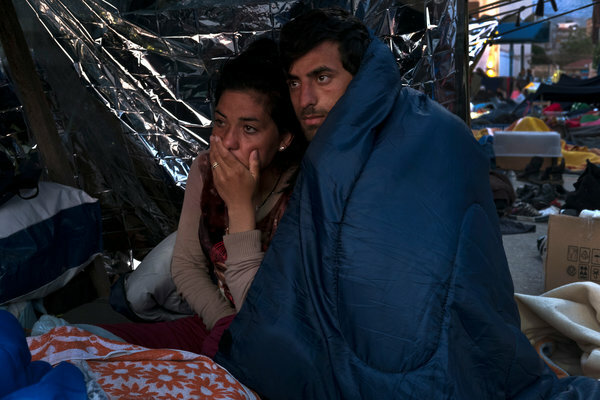 The clash was the latest in a series of violent episodes at migrant camps and gathering places across Greece, where more than 52,000 migrants are trapped after Balkan countries shut their borders along the path that migrants had been taking to Germany. 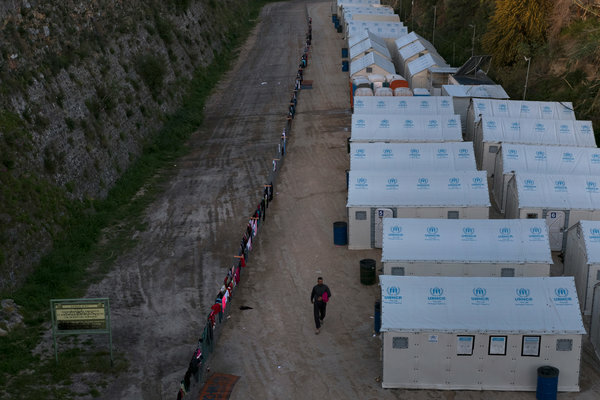 A migrant camp near Chios. A brawl involving nearly 1,000 Afghans and Syrians last week exposed the growing tension in Greece. The seemingly arbitrary division has roused incomprehension and bitterness among an estimated 13,000 Afghans stuck in Greece. They resent being labeled job seekers, rather than refugees fleeing precarious conditions that many say the United States and Europe helped create in Afghanistan. 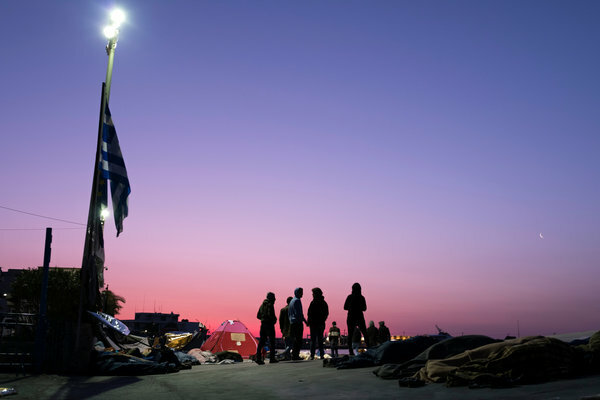 At Piraeus, the tourist port of Athens, where nearly 5,000 migrants have lived for more than a month in warehouses and tents, fights between Syrians and Afghans are now commonplace. Around 300 young men clashed last week in a three-hour melee, leaving eight hospitalized. Migrants and the Greek authorities say they expect tensions to escalate as the deportation program slowly unfolds. More than 52,000 migrants are trapped in Greece after Balkan countries shut their borders. About 200 migrants, mostly Pakistanis and Afghans, were returned to Turkey on Monday, and an additional 124 were forcibly sent back on Friday. Around 500 migrants broke out of a detention center on the island of Samos on Thursday amid fears that they would be returned to Turkey. In the meantime, migrants of differing nationalities are waiting in camps and other gathering places as anxiety about their fate mounts. “It feels like being in a zoo,” Mr. Alkhalaf said. Such was the case in Vial, an enclosed, military-style camp on an isolated hilltop, which the Greek government opened before the March 20 deal. Designed to hold 1,100, Vial filled quickly with nearly 1,800 migrants, mostly Afghans and Syrians, who had sailed to Greece after the new plan for deportations to Turkey had taken effect. At first, people banded together, protesting their detention with chants of “We want freedom!” But within days, the solidarity vanished, migrants who were sheltered in the camp said in interviews. Amid rumors that Afghans and other non-Syrians could be deported, anger boiled, and scuffles began to break out between the two groups. Then, around midnight Friday, the tensions exploded. Depending on who recounted the story, either an Afghan or a Syrian man picked a fight. In a flash, others jumped in, then a wave of violence engulfed the camp. Men grabbed heavy stones scattered on the perimeter of the camp to use as projectiles. Some ransacked a Doctors of the World medical clinic, taking knives and dismantling beds to fashion batons. Five people were seriously injured in the melee, which continued on and off until dawn. When riot police officers showed up around 6:30 a.m., they promised to secure the camp, migrants said in the interviews. But few of the migrants wanted to risk the possibility of more violence. As the sun rose, men, women and children grabbed belongings and broke part of the barbed-wire-topped fence, making their way down a steep dirt embankment as a helicopter circled. By midmorning, more than 800 people had marched to Chios port, in sight of a red Turkish ferry that is to be used for deportations. Many, including Mr. Alkhalaf, had hoped to wait at the port until their asylum applications were heard. But their presence quickly stoked anger among right-wing groups, who massed around the migrants Thursday night, throwing small firebombs, shouting slogans and threatening assaults. The police later cleared the port and forced most migrants to move to a nearby shelter. As a Syrian, Mr. Alkhalaf counted himself lucky, but it was beginning to dawn on him that even Syrians would face deportation to holding camps in Turkey before getting a chance at resettlement in Europe. When he went to declare asylum, he noticed a strange phrase in the application that asked migrants to attest that the last country they were in before reaching Europe — rather than the country they had fled — was too dangerous to return to. That country, Turkey, has been deemed safe by the European Union. Under the accord between the European Union and Turkey, for every Syrian whom Greece returns to Turkey, Europe will accept one Syrian who has applied for asylum from Turkey. All returnees would be placed at the bottom of a list of thousands of Syrians applying for asylum, which could leave them facing indefinite stays in Turkish camps before getting a chance to go to Europe. He gazed at the expanse of azure waters sparkling before him.